After you read this promise, take a moment and try to imagine the biggest, out-of-the-box thing that you could possibly think of for your life. No matter how big you think, God's plans for you are way bigger! The NLT Bible translates the bigness of God's plans as 'infinitely more' and the NASB Bible says 'abundantly beyond'. No matter what version of the Bible you choose to read this Scripture in, God is able to do way more for us than we will ever be able to comprehend according to His incredible power that is at work in us...right now! When I think that the same Spirit that raised Jesus from the dead lives in me and how that power is greater than any other power in the universe, it simply amazes me! Unfortunately many of us limit the power of the Holy Spirit in our lives by what we have experienced thus far. If we haven't seen too many miracles around us, we don't expect to live a miraculous life. 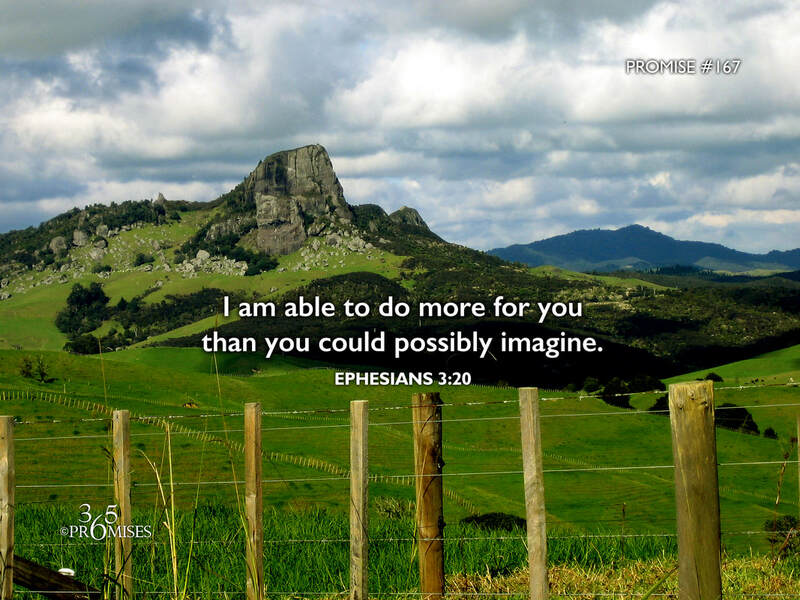 It is my prayer that the Holy Spirit will give us the power to take off all of the limitations that we have placed around ourselves so that our Papa can show us the incredible bigness of His plan and purpose for our lives. May each one of us open our hearts and minds to things that are exceedingly abundantly beyond what we could ever dare to ask for. Are you willing to ask God for a revelation of His great power that is already at work in you?